Swiss Mountain Transport Systems consists of location recordings made during the summer and fall of 2008 of the various transport systems which are specific to mountainous terrain – gondolas (aerial cable cars), funiculars, and chairlifts – of different types, of different vintages, and accessing different elevations, in different parts of Switzerland. In this way the album is a sonic investigation of the integration of such technology into the Swiss social-geographical landscape. Recorded from within mostly enclosed mobile environments, this emergent music includes mechanical drones, intermittent percussiveness, and transient acoustic glimpses of a vast surrounding landscape inhabited by humans and other animals. Sleeves Received is a Tumblr documenting gems from The Wire’s mail bag. Music, much of it exclusive to The Wire, selected to accompany magazine features, interviews and Wire related events. Compiled by The Wire Sound System. The wide world of field recordings with legendary ethnomusicologist Art Rosenbaum, location recordist Ernst Karel, and sound-scapist and Cabaret Voltaire co-founder Chris Watson. By Marc Masters and Grayson Currin. The reasons why a sound-artist might specifically limit the locations where sound is captured are numerous. In this case Ernst Karel has chosen the many transport systems typical of a mountain as the subject of a meticulous investigation. Ski lifts, chair lifts and cable cars, chosen for their particular and varied characteristics (age of construction and design etc) have been carefully researched, with all locations limited to within Switzerland. The main suggestion that runs through the project is the integration of „machines“ and „landscapes“. The insistent drones are often the result of brand new technologies, but feel as though they are perhaps not rooted and peculiar to those exact places. The mechanical, physical and atmospheric elements coexist charmingly in Ernst Karel’s sequences, which reverberate with space age and industrial influences. In the recordings there appear calmly intermittent robotic sounds that rattle and vibrate in tense structures. A rarefied atmosphere prevails, with few signs of human presence. Time feels dilated; there is a sense of nostalgia evoked by uninhabitable places, with recordings made both inside and outside the cab – a crossing through space that forms an additional, fully outlined ambience. The movement here is acted out but remains still; we listen from a top-down perspective, but enjoy a simplicity of experience and perceptions. Well, as the saying goes, you wait around for ages for public transport field recordings and three turn up at the same time: first there was the Psychogeographical Commission’s „Widdershins“, a disorientating trip on the Glasgow Subway system, followed a few months later by Chris Watson’s glorious „El Tren Fantasma“, providing compressed sonic highlights of a Mexican railway journey, and now Chicago-based composer Ernst Karel brings us a generous selection of sounds from Switzerland’s mountainous vehicles. Throughout the latter half of 2008 Karel documented a wide range of machines designed to get people up and down the slopes, from gondolas and funiculars to chairlifts and even a helicopter. Edits of these recordings, seemingly unprocessed and therefore purely documentary in nature, are sequenced across this 78 minute disc. As well as being a longstanding experimental musician, Karel is currently an anthropology lecturer at Harvard University, and this album initially seems to sit more comfortably with the latter role as a demonstration of how man’s mountain-conquering machinery has been assimilated by the natural environment, adding new routines and events to the previously predominant alpine ecologies. So, as well as emphasising the mechanical, unconscious rhythms as heard from within, we also witness the external sounds of birds, insects and the rustle of leaves in the wind as part of the journey. In addition to this, the casual chat of passengers can be heard in many of the pieces, inclusively placing human behaviour as a pivotal element in this environmental hybrid of nature and nurture. But, as well as being a kind of instructive insight into Karel’s „sonic ethnographical“ research, or a train-spotter’s audio-catalogue of Switzerland’s transport heritage, the sounds are a delight to behold by themselves. Like the aforementioned releases by Chris Watson and The Psychogeographical Commission, listening to the disk brings textures and tones to the fore that would otherwise go unnoticed by a tourist treading the same tracks. There’s often a violent drama in the juddering machinery that threatens the passengers with their own mortality; or there’s the musical qualities of the darkly droning engines that undulate and extend eerily along each incline. Indeed, if the album title and sleevenotes were less transparent about the soundsources the work would stand-up as a series of immersive and affecting electroacoustic set pieces describing, perhaps, more fantastical flights. This is one of Gruenrekorder’s series of Field Recordings. Obviously from the title it’s of Swiss Mountain Transport Systems. The 9 tracks were recorded between July 2008 and November 2008 by Ernst Karel who, to quote his website, works with analog electronics and with location recordings, sometimes separately, sometimes in combination, to create audio pieces that move between the abstract and the documentary. The pieces on this Cd are pure location recordings, no processing or manipulation has been used. 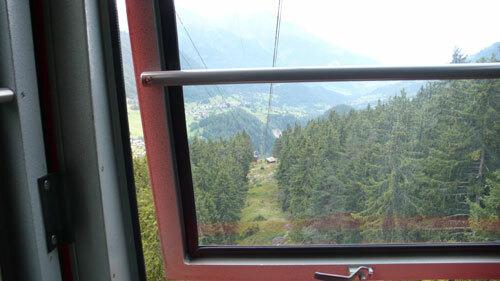 There are a variety of different types of transport recorded, funiculars, gondolas and chairlifts. There is even a recording of a helicopter transporting building materials but I think this is perhaps stretching the meaning of the title a little. As an album to listen to its perhaps more interesting than you might imagine. A number of the recordings have quite captivating rhythms to them and other ones have underlying drones that make the pieces sound like ideal backing pieces for industrial soundscapes. And looking at Ernst’s history it’s perhaps a shame he hasn’t taken some of these and added some of his electronics to them to make them more of a repeatable experience. There is, in the notes with the CD, information about the transport systems themselves and also about the equipment he used to record them. As a one or two time listening experience it’s an album that has its moments but I think in order for it to become more than that you would need some manipulation of the sounds or more complex and changeable sounds to begin with. With this release, phonographer/musician Ernst Karel continues his series of magnificently detailed field recordings of fascinating subjects. With Heard Laboratories (and/OAR 2010) his subjects were part of Big Science, while this time the locales are more municipal (or, perhaps, recreational). Once again, the recordings are more than mere sound catalogs or curiosities. Karel’s ear for the aesthetic, the interesting, as well as matters compositional, is a crucial ingredient here. It is easy to see why Karel chose these devices as a field recording source the elements of motion and travel are important to the effect these recordings produce. The progress of the vehicles through various mechanical segments and external environments combines an unmistakable sense of drama with the familiar, comfortable feeling of being en route. 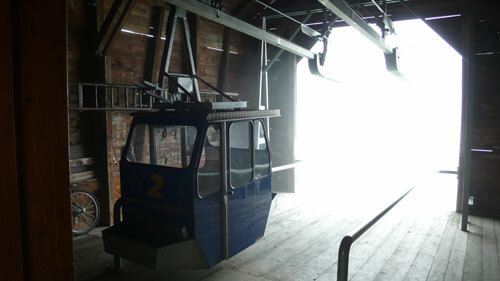 The first track, for example, was recorded inside an eight-seat gondola in Flumserberg, St. Gallen. As it cruises along its journey, a quiet mechanical drone sets the fundamental backdrop. Against this, acoustic events ebb and flow. Some are sudden and stentorian, as when it sounds like the gondola hits a set of rollers on the line. Others are more subtle, such as gusts of air and passing birds. And, as a jaunt along the gondola’s itinerary, the clip also has a clear beginning and resolution. It is a found symphony that would seem to have written itself, if not for our awareness of Karel’s adeptness in choosing and sampling his sources. Not all of the tracks create such a blur between the phonographic and the musical (to pretend, for the moment, that those categories are a separable). Track two has to be taken on its own terms. It features not only the mechanical sounds of a funicular (a cliff railway tram) but also the noises of its passengers. Contrast, perhaps, is at the fore. The grunts, chuckles, and bits of conversations of the travelers pull the listener into a familiar social setting that of transportation in close quarters with others. It is therefore striking, in retrospect, how the mechanical sounds in the middle of the ride seem to subvert this sense of the mundane. The listener is lulled away by their hypnotic patterns, and the quiet of the passengers suggests that they were too. In fact, a recurring theme if one wants to call it that in these recordings may be the contrast between the relatively placid atmospheres of travel itself versus the aural jostle found at launch and landing. Track three brings this out in stark relief. The listener will need a responsive set of headphones or speakers to pick up the minimalist burbling of a ride on the six-seat gondola near Aletsch glacier. At the stops along the way, though, the metallic clangs, whacks, thumps, etc. resonate within a cavernous soundscape. If not for the phonographic verit of it all, one might be tempted to suspect some underlying symbolism. There really is quite a bit of variety in these recordings, and the tracks manage to pique both intellectual interests and aesthetic ones. Although I have not tried it myself, one can easily imagine the reaction of someone to whom these recordings are described („How is that music?“) might contrast that of someone who walks in on the sublime drones found on track 6, a recording of a four-seat aerial tramway („Oh, who is that? Is that the new ___?“). Whatever Ernst Karel might have to say about the Art question in a manifesto, Swiss Mountain Transport Systems provides ample excuse to merely sidestep the question. Some of us simply like listening for its own sake, and there is much here to reward that pursuit. Ever been to the Alps? Well, even if you haven’t, you can imagine that in a landscape of towering mountain peaks, tiny human beings might have to find some unusual ways to get around. Travel along the vertical, as well as horizontal, axis, is the necessary norm. The ground may be crazy steep, or far far below. Field recordist Ernst Karel, whose Heard Laboratories cd documenting „the sound of science“ we’ve previously recommended, visited Switzerland and produced this disc which will help you to imagine that lofty Alpine landscape, in a unique way, by presenting the sounds of the various modes of, indeed, Swiss mountain transport that he encountered – various suspended gondolas, an aerial tramway, a „transverse-seat chairlift“ (the last one in Switzerland, now out of service, we’re told), a helicopter, and a couple funicular cable cars (inclined trains, which are wonderful things, as depicted on the back cover of this release). Of course, as a sonic experience only, this „documentation“ is as (deliberately?) mysterious as it is enlightening. The mechanical clanking, the whirring, the wind, the murmurs of passengers… these ambient sounds sometimes quietly soothing, sometimes noisy, certainly curious. Makes for a nice companion to Chris Watson’s El Tren Fantasma highlighted last list, for those into journeys through sound (of journeys) – though this one is raw audio verite, not a „fictionalized“ construct like Watson’s disc. A few color photos are provided on the packaging, along with location, date, etc., specifics of the individual tracks (details for, ahem, trainspotters). Nicely done, from the same great field recordings label that last brought us the Water Beetles Of Pollardstown Fen (more of those soon on the way, btw!). How can you distinguish the quality of one untreated field recording against another? The equipment might be better or the sequence could be cohere into an abstract narrative (see Annea Lockwood’s excellent A Sound Map of the Danube), but it all comes down to sound. And Ernst Karel has found incredible vibrations on these Swiss gondolas. Maybe it helps that I myself experienced these naturally droning and just plain-cool sounding machines when I was 16 — those clicks, whirs and distant moos from grazing cows have stuck with me for over a decade. In a post-Cagean world where everything is music (and it is), Swiss Mountain Transport Systems is musical escapism in a real-world environment. As far as untreated field recordings go–now yer talkin‘. It obviously helps if your ear is attuned to especially wonderful groups of sounds as Karel’s was during some hiking expeditions in Switzerland that involved the usage of various modes of transportation–gondolas, funiculars, etc.–that have as one of their salient qualities the generation of rich and spectacular sonics. He recorded them extensively and extracted the nine pieces presented here without any manipulation. What can one say? I’ve thought about qualitative issues in this regard for quite a while now and the best I can come up with, short of technical excellence in the recording, is that saying „yea“ or „nay“ on a given example involves more a general overlapping of taste between the documentor and the listener than anything else. Person X will find one group of sounds inherently fascinating while I, even trying my best to get into non-discriminatory, post-Cagean mode, may not. Karel found these sets of sounds delicious and I heartily agree with him. Were I on one of these gondolas, I’d likely be paying as much attention to the aural atmosphere as the visual one and I’m very glad Karel got them down. Your mileage may vary but I found these clunks, whirs, bells, chatter, wheezes and rumbles a great joy of which to partake. Check it out. σε αντίθεση με τον watson ο karel εδώ παρουσιάζει τη δικη του εκδοχή ίσως πιο ‘άμεση’ χωρίς πολλές πολλές επεξεργασίες παίζοντας με τους ήχους και δίνοντας μας μια όσο το δυνατό πιο πειστή καταγραφή των μετακινήσεων που έκανε το 2008 όπου και οι ηχογραφήσεις αλλά στημένες με τέτοιο τρόπο που όπως και το el tren fantasma να σε ταξιδεύουν και να σε κάνουν απο ακροατή συνταξιδιώτη του. απο τους ήχους των μηχανών που κινούν τα τρένα, στους ήχους των τρένων μέσα και έξω απο αυτά παίρνεις μια ιδέα αυτού του ταξιδιού όχι μόνο πειστικά αλλά και μέσω φανταστικών ήχων. ομολογώ ότι του γούσταρα τρελλά αυτό το cd (οκ wav γιατί το κατέβασα έχουν φρακάρει τα ράφια) νομίζω ότι είναι μια απο τις πιο αγαπημένες μου ηχογραφήσεις του ernst karel τον οποίο παρακολουθώ χρόνια, ποτέ δε με εξέπληξε αρκετά σε συμμετοχές ή με τους ekg εκτός απο στιγμές, όσο με αυτή την ηχογράφηση! Горный транспорт Швейцарии – слаженно работающая система, обеспечивающая доступ практически в любую горную часть страны в случае как жизненной, так и туристической необходимости. Канатные дороги, горные поезда, подъемные кресла, рассчитанные на нескольких пассажиров, фуникулеры и гондолы – эти и другие технические приспособления перекроили ландшафт километрами рельсов, дорог, проводов. Посетив многие трассы, Эрнст Карел записал на микрофон все звуки, сопровождающие подъем или спуск на том или ином транспортном средстве, а позже подготовил альбом, который так и назвал, «Swiss Mountain Transport Systems». Почти каждая композиция здесь начинается с открывания-закрывания дверей, и эти несколько секунд, пожалуй, самые громкие, бьющие по ушам лязгом замков и защитных устройств, скрипом и грохотом. Зато потом, на всем протяжении подъема, вам предстоит, судя по всему, испытывать самые положительные чувства (незнакомые, в принципе, тем, кто когда-либо пользовался подобным транспортом в российских туристических «угодьях»). Гипнотическое биение механических ритмов оборудования, выполняющего свою работу в штатном режиме и готового делать это вечно, сменяется (видимо, когда фуникулер или гондола поднимаются на достаточную высоту) размеренным шумом, иногда сведенным до состояния благостной тишины, в которой возникают еле различимые вибрации однородного гула. В зависимости от трассы меняется и окружающий фон, а также мы можем услышать голоса других пассажиров и обслуживающего персонала, не подозревающих, что они «попали в историю». Вообще, впечатление от прослушивания создается какое-то благостное и позитивное. Вроде как солнечный свет и чистый горный воздух проникают сквозь окна, и эту первозданную красоту и тишину трудно испортить даже монотонным стуком шестеренок и потрескиванием контактных проводов. Однако эти же звуки заставляют серьезно задуматься, до какой степени люди готовы перекраивать окружающий мир под себя и где находится та грань, за которой наступает необратимые последствия для природы. Интересный релиз. Грамотная работа со звуком и хорошие условия обеспечивают эффект присутствия и дают возможность «заглянуть» вглубь сложной системы, обеспечивающей жизнедеятельность многих районов европейской страны. Absolutely one of a kind. Karel has made field recordings of gondolas, chairlifts, funiculars, and various aerial cable cars in Switzerland, without any self righteous tweaking or altering. These sounds are coming straight from the cars. Mostly a calm, serene, and hushed album, with lots of motorik rhythms and mechanical percussion breaking through. The man-made sounds are the focal point, gears grinding, bang clanking, crunching, howling, etc. This is one that demands your full attention though, as it’s easy to think there’s nothing going on if you’re not 100% intent on hearing it. Despite the spiked mechanics, it’s a record of profound & solitary quiet. But it’s not empty by any stretch of the imagination. Just the opposite. It’s full of life. Every little detail is captured, the wind carrying through the mountains, distant animals, hushed hums, Swiss voices, it’s celebrates the minutiae and tells me to live in the moment and enjoy what I hear around me. Pay attention, hear it, live it. Truly fantastic. Swiss Mountain Transport Systems could be my new life mantra. Many of us live in a state of near constant self-imposed sonic stimulation. We are forever talking on cellphones or listening to ipods, rushing from place to place with music and podcasts and satellite radio and videos streaming on our tablets. Meanwhile the world goes on around us. The irony of this is if one knows how to listen to the world – the real world – one can often find a soundtrack equally rich and stimulating and beautiful to anything we can think to cram onto our mp3 players. 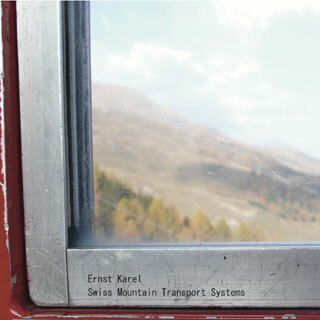 Ernst Karel – a sound artist and musician from Chicago – demonstrates this truth with jaw dropping aplomb on his latest release, „Swiss Mountain Transport System.“ The title of this album says it all. At close to 80 minutes in length, Karel offers his listeners a number of unprocessed field recordings taken on various gondolas, funiculars, and chairlifts in the mountains of Switzerland – from ancient, creaking gondolas to whirring, highspeed chairlifts. That’s it. No instruments, no electronic processing, no synthesizers or oscillators or guitar feedback. And yet, despite that, Karel has created one of the most gorgeous, engaging, and fascinating albums of the year. It also happens to work almost perfectly as a drone or minimalist noise album. Through Karel’s carefully positioned microphones, these means of mountain conveyance can be heard as accidental electro-mechanical music boxes, an entire world of sound contained in each car. They drone, they are percussive, they amplify and refract and echo and encase sound. Wires ring and reverberate, gears rumble and click, doors creak and whoosh. The mechanical and industrial intersects with other elements of the world – murmured voices across platforms, a peal of church bells off in the distance, a clang of cow bells, a clattering of helicopter rotors, frigid gusts of wind. As Karel captures it, these unprocessed, unorchestrated sounds – largely mechanical and man-made but nonetheless „organic“ in that they belong firmly to a lived environment, integrated in with the natural, and are not created as an end in themselves as with music or intentionally crafted sounds but rather exist as a part of the man/nature soundscape that is a byproduct of a world inhabited by living beings – are immensely affective and evocative. For an album that seems to be about movement, about traversing space, these recordings are incredibly successful not because they are beautiful – though they absolutely are – but because they evoke the mountains and they evoke transportation through that rugged terrain in a remarkably lucid way. Recorded in stereo with multiple mics, this album truly comes to life when heard through a decent set of headphones. The sound envelopes the listener and we are whisked away through the Alps as Karel’s recordings convey with remarkable clarity a sense of distance, of movement, of sound as it’s really heard, in the real world. A collection of pure field recordings, it is perhaps ironic that in order to hear – as Karel has captured it – not only the utter beauty in the perpetual sonic landscape that surrounds us but also its incredible, inherent musicality that we must sit and listen closely, headphones firmly donned, without distraction. But one of the things that’s so special about this album is that once you listen to it in this way, once you recognize the richness and depth of the world of sound that exists outside our headphones and in the most unexpected of places (we don’t think of funiculars and gondolas as being all that interesting as such), it’s possible to start discovering similar depth in places one experiences daily and simply never pauses to think about twice. As with all important and truly successful art, „Swiss Mountain Transport System“ can radically alter the way one perceives the world. Be warned: this album requires a good deal of patience. Many will find it boring but for those really willing to sit with it, its rewards continue to unfold listen after listen. It’s refreshingly direct – a rarity in our world of ultra-processed music – and restrained, elegant and as simple as can be. At the same time, it’s deeper and more nuanced than pretty much anything I’ve heard in a long while. A completely essential listen, one I cannot recommend highly enough. Swiss Mountain Transport Systems is framed as a ‘sonic investigation’ into the many chairlifts, gondolas, funiculars and cable cars that navigate the country’s landscape, but it would be naive to suppose that Ernst Karel – once an active improvisor in Chicago; now a manager of the Sensory Ethnography Lab at Harvard – is a dispassionate about where he points his cardioid mics. His 2010 album Heard Laboratories compiled field recordings from a range of Harvard’s research spaces, spotlighting an unheard world of scientific toil, clamorous with the clink and grind of flesh behind machines carrying out complicated chemical processes to the chatter of caged tamarind monkeys. Its successor steps out in similarly neutral clothing. Its nine tracks are identified only by locations and dates (between July and November 2008), along with a few brief descriptions. Running between four and 13 minutes, each track appears to be charting a complete journey; even devoid of context, the sounds trapped on tape are curiously absorbing. They can be both soothing and suspenseful, as on “Oberterzen-Unterterzen”, where the low rumble of machinery and a keening wind are punctuated by periodic clankings and brief snatches of birdsong. The sense soon emerges of a landscape idealised yet only half-conquered by humans. The illusion of gliding, godlike, up a mountainside rests upon loud and often ungainly machinery, as heard on “Stans-Kälti”, where strains of (stereotypically) Swiss cowbells are almost drowned out by the violent exertions of the funicular train. Karel also hints at coming obsolescence: the helicopter heard on “Simplon Pass” is transporting materials to a road builder, even as systems only recently documented by Karel have since been removed. Transport is less solid than its imposing infrastructure suggests. Since the mid nineteen’s Ernst Karel has been active releasing both solo albums and collaborative projects. He works with analog electronics and with location recordings. The sounds on “Swiss Mountain Transport Systems” consist of recordings taken in different locations of Switzerland during the summer and fall of 2008 plus electronic processing. The foundsounds are a wide range of transport systems used in the mountains such as gondolas (aerial cable cars), funiculars, and chairlifts both old and new machinery. The mechanical sounds blend with sustained drones are a perfect description of the transport systems and environment. Swiss mountain transport system is a good example of how, when heard out of context, sounds are even more capable to create a separated sensible experience other than the one we experience with the objectual causality of those sounds. There are two experiences occurring simultaneously that are linked and yet completely independent. On the liner notes of the release it reads “…gondolas (aerial cable cars), funiculars, and chairlifts – of different types, of different vintages, and accessing different elevations, in different parts of Switzerland. In this way the album is a sonic investigation of the integration of such technology into the Swiss social-geographical landscape.”. What I hear deals with deeper and more sensible and experiential aspects than the landscape and the social-geographical considerations, again this is about sound about the reduced hearing overlapping the casual hearing, about hearing something beyond the actual documented object. The vehicle is both an instrument to link two geographical places but it is also the place “where traveling occurs” and this phenomena is clearly depicted on this work. Traveling on vehicles is about moving geographically but also about remaining still, about quietly being aware of movement, and this is when this release works on a poetical level. 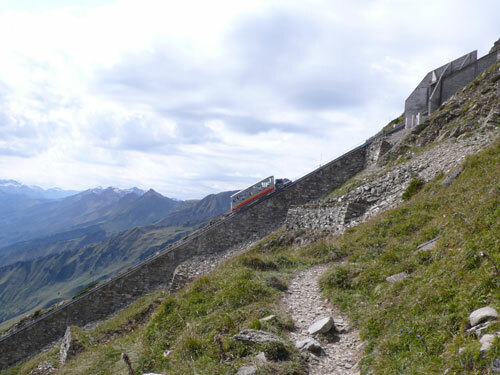 On Swiss mountain transport system the listener effectively experiences stillness and movement and this contradiction underlies the irony and innocence that occurs when formal aesthetics considerations are taken in the process when the object of interest is reduced and articulated. When John Cage entered into an anechoic chamber he noticed there was no silence because he could hear something…his body, the vehicle. The thumping sound of the steel cable and the rhythmic crackling encounter of the supporting towers are the recurrent sonic details in this work. 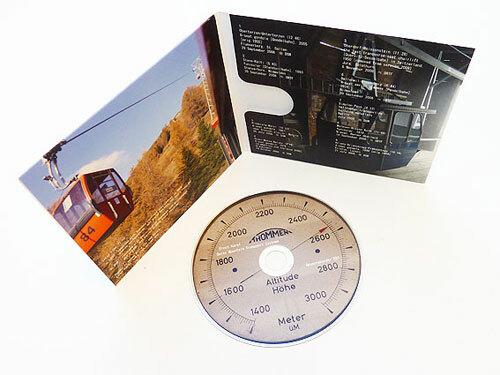 Throughout the whole album, the sound of automatic cable cars and chairlifts seems to be put in front of everything, the aural attention is focused on the mechanics of transportation and on the propagation of the vibrations from the bullwheel in the terminal, passing through the cables, the spring-loaded grips, interacting with the steel structure and finally echoing inside the cabin. These recordings recreate an immersive and muffled environment and the listener rapidly becomes a passenger: the urge to look out of the window to see the trees and the green fields is inevitable. Technically speaking these are fine recordings of course, but what I found really compelling is the 3-D stereo sound sensation, it’s like actually being inside a cable car and I wouldn’t be surprised if the recordist had used binaural microphones. In the second part of this work some natural sounds from the outside gently reach our ears, as if they’re passing through a slightly open window. They are filtered and distant, barely perceivable but nonetheless extremely important in the overall scheme of the audio documentary. The chirping sound of the crickets, cows and cowbells, voices and dialogues, everything has been carefully included to provide a full aural experience of, first and foremost, the transport system but also to give us a quick glimpse of the Swiss mountain landscape. As it often happens with Gruenrekorder’s works, this is an ambitious project that requires great attention and patience to be completely understood. A fine work indeed that deserves to be listened. The worst thing about the relapse [or the ‘Istanbul Goat Virus Round Two’ as its known round these parts] is that it robbed me of my powers of concentration. During the first phase of its manifestation two weeks ago all I needed was the strength to pull a CD from its sleeve and insert it into the stereo. During the more virulent second phase all I could manage was staring out of the window whilst listening to the cricket updates on Five Live Sports Extra. As I slipped between coma and semi coma news of wickets falling in Somerset and Warickshire entered my head only to leave again moments later. As a means of whiling away the days it was as good as it was going to get. For some strange reason the sound of any kind of music drove me to absolute torment. I decided it was best left alone. These last few days then have given me some idea of what my retirement days might be like and if I ever make there in such lousy shape I may as well take up alcohol as a distraction. Thankfully I’d become familiar with this batch of Gruenrekorder releases the first time around so it was a just a matter of working my way back in. Gruenrekorder is a two man label stroke organisation dedicated to the promotion of experimental music and phonography. Phonography meaning ‘an acoustic experience loaden with musical sounds’. Now I’ve always been a bit of a passenger when its come to Field Recordings [a term that Gruenrekorder also use], I do have some of Chris Watson’s work, some Touch releases that cover the same ground and the odd bit by various Schimpfluch members where they’ve stuck microphones hither and thither and recorded whatever’s emerged, but this is my first serious chance to get to grips with a label dedicated to such material and to give it a serious appraisal. At least with Field Recordings you know what you’re getting. It says it on the tin. Swiss Mountain Transport Systems is, as you’d expect, the sound of ski gondolas, funiculars and chair lifts all doing what they do up the sides of Swiss mountains. The genius of it all is finding the musicality within these things. So the door locks, the winding motors, the support towers, the funicular tracks and the non mechanical outside sounds such as cow bells and people al become part of a greater experience. It seems obvious but I want to point it out. The first and longest track here is probably Karel’s best; ‘Oberterzern-Unterterzern’ is a 12 minute piece [each track is, I’m assuming, a complete journey] which begins with the closing of the automatic door locks before emerging into open space and a wonderful hum drone. I guess that the suspended gondola is acting as an enclosed speaker with the wire becoming a conduit for the noise produced by the winding motors. The pitch of the hum changes as the trip continues. The serenity is abruptly interrupted as the car passes over support towers. The hum builds and dies away only to be severely jolted by another support tower. Its an impressive piece of field work that will certainly appeal to anyone with a bent for Industrial ambience, which in a way, I suppose this is a pure version of. For a gondola ride alone its worth seeking out for its musicality, should you ever find yourself in Flumsberg please indulge. The other three gondola rides on here have their own idiosyncrasies but nothing as expansive as this. The funiculars are harsher affairs as you’d expect with the added bonus of stops along the way to pick up passengers. The eleven and a half minute chair lift ride that is ‘Oberdorf-Wiessenstien’ [now sadly defunct] is a white knuckle drone ride of buzzing inertia that builds in intensity as it nears the winding station and gently fades as it recedes. Its all recorded with incredible clarity and will reward anyone who takes pride in their playback equipment. My only gripe was track seven which is nothing but the sound of a helicopter transporting building material. Not what it said on the tin. Gruenrekorder don’t just release Field Recordings and Sound Art though, you’ll find them investigating Soundscapes as well as running a workshop and an intermittent dual language downloadable PDF magazine called Field Notes. Its archived and worthy of your attention. Theres also a few more free downloadable albums beside the one I mentioned. Having never heard of Gruenrekorder a month ago I know find myself a fervant fan. What interests me now is has anyone done any true ‘Industrial’ field recordings? I mean in actual working factories? I’ve been musing this for the last few days. I wonder if there are too many obstacles involved? Its not like you can just turn up at a factory with your equipment and say ‘I’d to record your machines please’. First you’d have to find out which machines makes the most interesting noises and that in itself would take months of ground work. Then you’d have to get the companies permission. The company involved would no doubt have to give you assistance as I’d doubt whether they’d just let you wander around their premises until you found what you wanted. The results could be interesting, just hard to collate. A few words by The Field Reporter Editor Alan Smithee plus PART I of the lists with the most relevant works of 2011 made by our staff and other artists, curators and journalists.